Houston Granite and Flooring is located in Harris County, Texas. Our dedication to our customers needs and the focus on producing quality products in a timely manner has propelled us, in a relatively short amount of time, to being one of the industrys most innovative leaders. 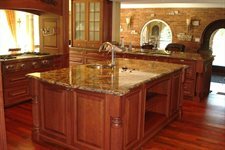 Granite countertops manufactured by Houston Granite and Flooring are guaranteed to be of the finest workmanship and quality available anywhere. Your stone surfaces are crafted by fabricators with generations of experience in stone fabrication. We pride ourselves on being large enough to handle any and all of your orders for granite counter tops, yet small enough to provide you with the personal attention to detail that you would rightfully expect from any serviceoriented company. We will help you with your selection for the custom fabrication of your new, granite kitchen counter top, professionally install it and show you how to care for it once its installed. Houston Granite and Flooring will generally install your granite countertop in your home within 72 hours of removal of existing countertop. As service professionals ourselves, we understand that time is money on a jobsite. You need materials delivered in a timely manner that are accurately sized, correctly templated, and that install easily, the first time, as planned. Designers, architects and renovation professionals look no further for your supplier! Houston Granite & Flooring is the premier source for granite, marble and a wide selection of other natural stone fabrication in this area. Houston Granite and Flooring will help you engineer your job, figure your granite countertop cost, and be available for you every step of the way from the initial order to the finished installation.